Millie Bobby Brown might be 13, but when it comes to all-around badass-ery, the girl’s got us beat by decades. 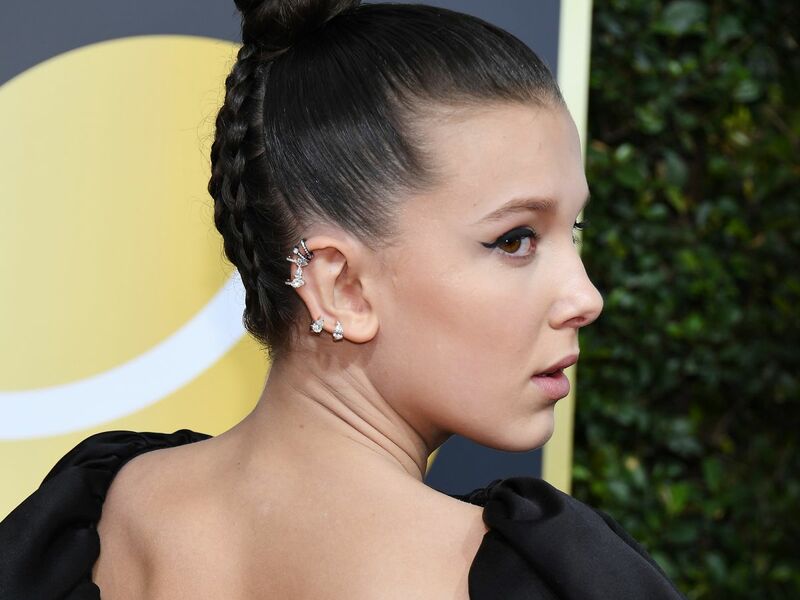 At the Golden Globes, the Stranger Things star’s hairstyle had some magic of its own. On first glance, you can see three braids peeking out from underneath her bun (created by talented hairstylist Blake Erik). But, take a second look, and you might notice that the plaits resemble an “M,” which many speculated to be her first initial. Other Instagram users pointed out that the two crisp parts form an “11,” perhaps an ode to her standout character in the series. Erik says that the three braids simply fit the look they were going for — and flattered the shape of Brown’s head. Brown, who collaborates on her hair looks with Erik, loved the finished result. But Brown’s hair wasn’t the only standout aspect of her look tonight. The young star, who wore a black gown as part of tonight’s protest against sexual harassment, sexual assault, and gender inequality, also showed up with a jet-black cat eye, created by makeup artist Kelsey Deenihan using Avon True Color Glimmersticks Eyeliner in Blackest Black and Avon True Color Wide Awake Mascara. Perhaps the intricate look was the reason Brown was late to the red carpet and couldn’t walk with her Stranger Things co-stars. As one Twitter user reminded us, a queen is never late — everyone else is simply early. Lotto Weekend: $33 M won in Edmonton; $15 M to go!